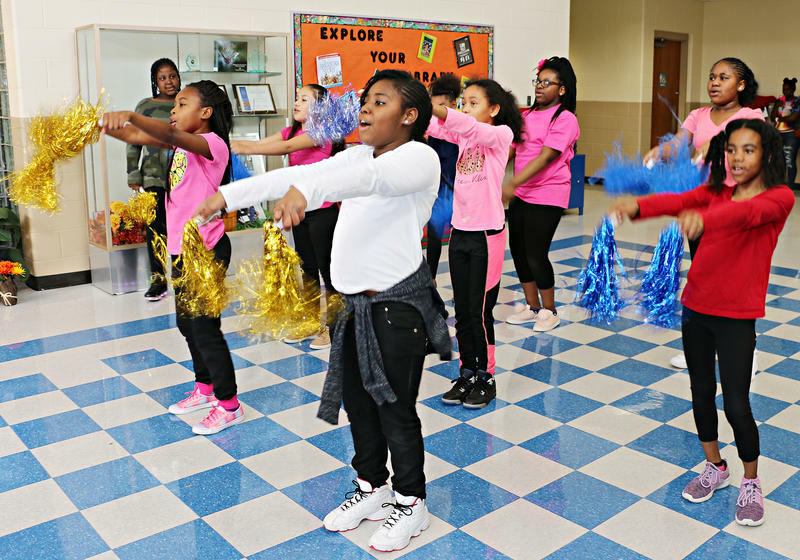 Students at Phillips Elementary in the Kansas City Public Schools perform a cheer. The school was awarded $600,000 from education nonprofit SchoolSmartKC. Gladstone Elementary is also getting $600,000 from SchoolSmartKC. The principal plans to hire a data coach to better connect teaching to the state standards. Three schools will get $1.4 million from education nonprofit SchoolSmartKC to improve student performance, Kansas City Public Schools announced Friday. Principal Dana Carter says she started to cry when she found out on the second-to-last day of school she’d have an additional $600,000 to implement Gladstone Elementary’s strategic plan. With the SchoolSmartKC money, Carter plans to hire a data coach to work with teachers on the state’s standards. 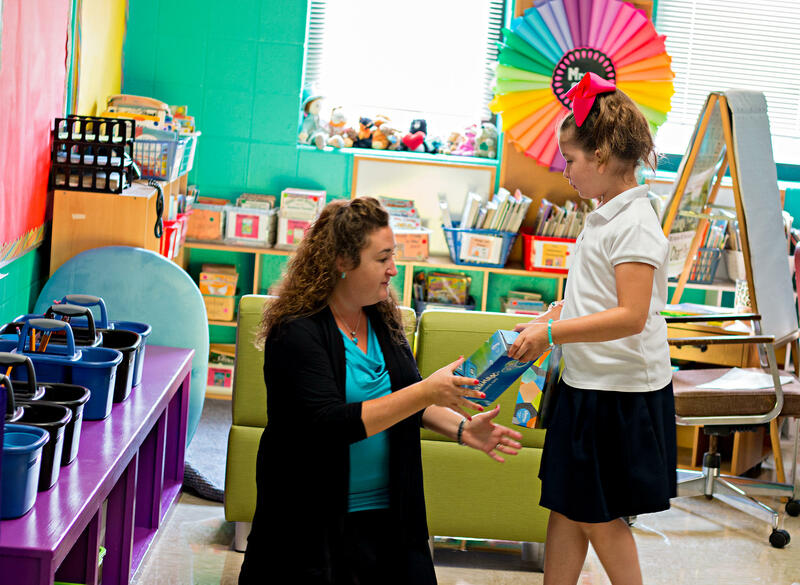 Fifty-nine percent of Gladstone Elementary students are English language learners. Carter says her students made significant enough gains this year to move off the state’s list of low-achieving “focus” schools. Wendell Phillips Elementary also recently moved off the state’s focus list. Principal Deloris Brown will use SchoolSmartKC’s $600,000 grant to make Phillips a trauma-sensitive school. Teachers and staff at Phillips will get training on how to respond to the trauma students bring with them to school. Brown says the school will also be able to host a three-day kindergarten boot camp before the start of school in August thanks to the grant. 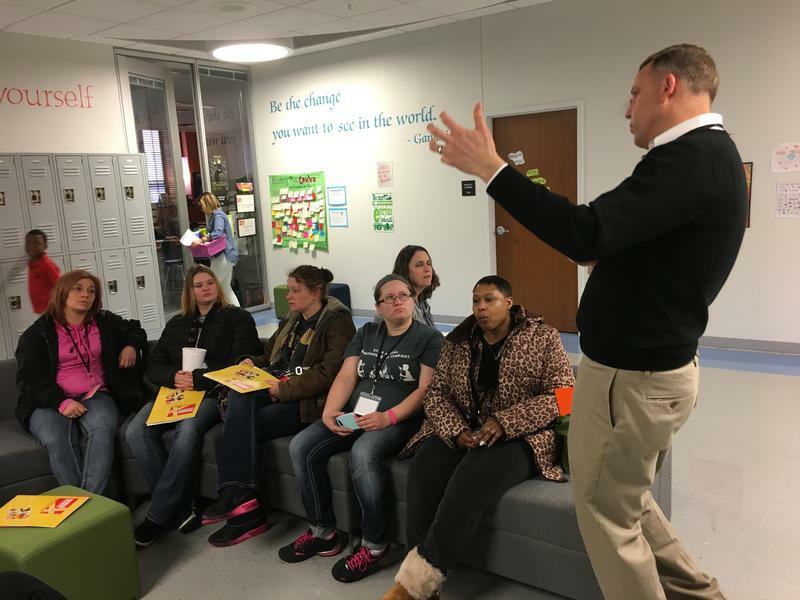 Northeast High School received $200,000 from SchoolSmartKC to expand its Advanced Placement course offerings and develop student leaders. The school’s graduation rate has increased 14 percentage points in two years, from 54 percent in 2015 to 68 percent last year. The grant process was competitive. Eight KCPS schools submitted applications in the fall. The schools that were awarded money will have three years to use it. SchoolSmartKC’s goal is to get a majority of schools in Kansas City performing at or above the state average by 2026. A few years ago, Missouri’s suspension rate was the highest in the nation for young black students – an unfortunate distinction that forced Kansas City Public Schools to rethink discipline. The district did away with automatic suspensions for a lot of less serious violations. This year, KCPS issued 31 percent fewer out of school suspensions to kids in kindergarten through third grade. A $1.3 million grant will help a downtown charter school expand. “Whenever you’re growing and expanding, there are a lot of operational costs associated with the planning and staffing something while it’s still small and before it can reach full capacity and scale up to a point where it’s self-sustainable,” says Dean Johnson, executive director at Crossroads Academy.